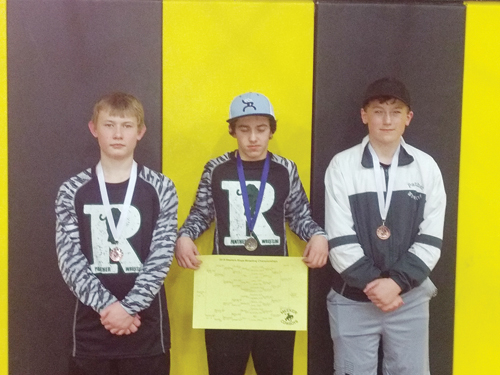 Jaxon Torsell, Kobey Chism and Kasen LeBleu wrapped up the Rangely middle school Panther wrestling season with a third, first and third place finish, respectively. RANGELY | The Rangely middle school wrestling team finished their season this past weekend. The Panthers hosted the Hayden Tigers in a dual meet on Friday. Winning matches for the Panthers were Landon Carlson, Anthony Dorris, Kobey Chism, Sage Rhea, Jaxon Torsell and Kasen LeBleu. On Saturday the team competed in the Meeker tournament. Three Panther wrestlers placed in the tournament. Kobey Chism took first place, Jaxon Torsell and Kasen LeBleu both placed third. Landon Carlson and Anthony Dorris were one match away from placing. “As coaches we are proud of our team’s effort they put into the season,” said head coach Jeff LeBleu. The team included sixth graders Landon Carlson, Clay Allred, Brode Low, Izaiah Moody and Marcos Quintans; seventh graders Kobey Chism and Jaxon Torsell; and eighth graders Colton Stevens, Curtis Reeves, Anthony Dorris, Sage Rhea and Kasen LeBleu. The team would like to thank Mike and Brielle, Ryno and Becca for supplying the fruit and drinks this season.